The music genre, led by Guitar Hero and Rock Band, was once one of the top revenue drivers for the games business, fuelled by gamers’ eagerness to feel like a rock star and rock out to their favourite tunes. As the plastic peripherals suddenly reached a saturation point and gamers got bored with a feature set in iteration after iteration that failed to really innovate, sales started declining precipitously. Following 14 different SKUs in a little over just two years, Activision finally put the Guitar Hero business to rest. In the days following the big news, there have been countless opinion pieces online, pointing to the fact that Activision milks its franchises to death, and with the doubling down on Call of Duty, that the heralded shooter franchise is next in line to be given the Guitar Hero treatment. And while there’s always a risk of franchise fatigue for any publisher’s big franchise, labelling Call of Duty as the next Guitar Hero would be a mistake. The analysts IndustryGamers spoke with universally agreed that these are two very different situations, and Activision doesn’t need to “learn” from the recent Guitar Hero outcome. If treated with care, there’s no reason that Call of Duty can’t last for a long time to come. Guitar Hero and other former franchises may appear to be publisher failures, but the truth is that strip-mining franchises is a successful, risk-averse strategy. ATVI made good money on GH. Sequels were produced quickly and cheaply. Covering all platforms gleans higher initial retail orders and a single marketing campaign efficiently advertises on top of the network effect of a hot brand. The hit it and quit it model — carpet-bombing the market with sequels and then slashing the assets — pays off big in the short term, so ATVI’s shareholders are happy. ATVI is learning to execute this strategy with greater efficiency each go-round. There is an alternate strategy, but it’s more risky as it requires careful investment and isn’t necessarily as lucrative. Publishers can attempt to keep a franchise going for a longer period of time by spacing out sequels. Sports licence franchises can be sustained on a yearly release due to seasonality and keeping stats and rosters current. Other franchises survive longest by spacing out sequels once every two or three years. It is difficult to keep franchises fresh, as developers must improve upon and innovate within gaming fans’ mutable comfort zone. In either scenario, the trick is to keep the franchise selling for as long as possible before it (or the developers) burn out. The endgame is always ugly because layoffs are typically involved. I don’t think they are comparable at all. GH is a franchise that people buy once, because the peripherals are great. As it saturated the installed base, the only buyers were people who are new console purchasers, and the “fad” appeared to wear off at the same time. GH was a victim of its own success. CoD, on the other hand, has a vibrant online community that keeps growing. When a new version comes out, the “network effect” kicks in, and many people buy it because their friends have done so. The risk to the franchise is competition, not people tiring of the gameplay. If I am wrong about Project Beachhead charging, then they are doing it to establish even greater barriers to entry, and to protect the franchise. CoD won’t fade unless Activision opens the door to competition by making a bad game. I really think the situation with COD and GH are hard to compare except for the fact that as a public company there is definite pressure to show a steady revenue generating product line. With GH it seemed that it was very likely to be a fad that would be milked until it dried out. It was somewhat the same issue as extreme sports and hunting games. FPS games are a long proven genre and thus don’t seem to have fallen into that fad issue. However, there is a very real danger of milking a franchise and causing quality to decline, which can result in turning consumers off. With COD I think the danger is trying to maintain the quality of the franchise and making sure they don’t release product just to release product. With GH I think it was just consumers getting tired of the genre and wasn’t necessarily because of quality. So I think really there are not too many lessons to be learned from GH that can apply to COD. With COD it is all about keeping the quality up. 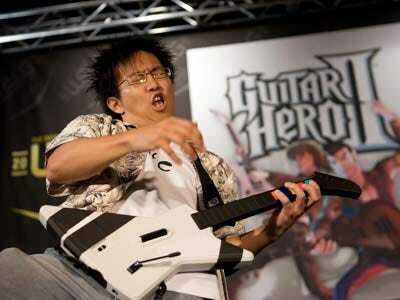 Guitar Hero. The entire music category’s fate was inevitable, and no single publisher is to blame for its demise. It was an entertainment fad. Call of Duty are two different franchises with two different demographics. I don’t believe any lessons learned from the music category applies to the Call of Duty franchise. I trust that Activision knows what they are doing with Call of Duty and I remain unconcerned about the franchise’s future. I think music games were a fad – just like fitness games were at one point, and maybe dance games are today. But after years of franchise growth, I wouldn’t put Call of Duty in the same category. This is a franchise that has increased in sales every year for the past 6 or 7 years and has consolidated market share in the process. Could Activision mess it up? Sure, but if they focus on maintaining high game quality, fresh story-lines, and online multiplayer, then I don’t see an obvious reason for the franchise to decline. For a moment, Guitar Hero captured a collective artery; aggressively rolling in buzz it defined a new video game genre and then rolled over on itself, cementing a generational entertainment fad. Today, the console gamer seems increasingly mega franchise centric, gravitating toward an understood experience that excels from incremental polish, installed base growth and jumbo marketing campaigns; compliments of an ageing console cycle and risk averse management teams still reeling from a tremulous economic condition. All entertainment experiences have life cycles; an accelerated cultural burn will likely extinguish the cycle faster than a gradual iteration philosophy. Ultimately, it’s the development studio and collective culture that defines greatness, not Wall Street or the executive teams managing toward a linear path of growth.